A Gtk.ToolPalette allows you to add Gtk.ToolItems to a palette-like container with different categories and drag and drop support. A Gtk.ToolPalette is created with a call to Gtk.ToolPalette.new(). Gtk.ToolItems cannot be added directly to a Gtk.ToolPalette - instead they are added to a Gtk.ToolItemGroup which can than be added to a Gtk.ToolPalette. To add a Gtk.ToolItemGroup to a Gtk.ToolPalette, use Gtk.Container.add(). The easiest way to use drag and drop with Gtk.ToolPalette is to call Gtk.ToolPalette.add_drag_dest() with the desired drag source palette and the desired drag target widget . Then Gtk.ToolPalette.get_drag_item() can be used to get the dragged item in the Gtk.Widget ::drag-data-received signal handler of the drag target. Gtk.ToolPalette has a single CSS node named toolpalette. Get the target entry for a dragged Gtk.ToolItemGroup. the Gtk.TargetEntry for a dragged item. Gets the target entry for a dragged Gtk.ToolItem. Sets self as drag source (see Gtk.ToolPalette.set_drag_source()) and sets widget as a drag destination for drags from self . See Gtk.Widget.drag_dest_set(). Get the dragged item from the selection. This could be a Gtk.ToolItem or a Gtk.ToolItemGroup. Gets the item at position (x, y). See Gtk.ToolPalette.get_drop_group(). Gets whether group is exclusive or not. See Gtk.ToolPalette.set_exclusive(). Gets whether group should be given extra space. See Gtk.ToolPalette.set_expand(). Gets the position of group in self as index. See Gtk.ToolPalette.set_group_position(). Gets the size of icons in the tool palette. See Gtk.ToolPalette.set_icon_size(). 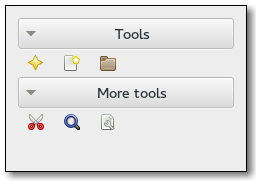 the Gtk.ToolbarStyle of items in the tool palette. Sets the tool palette as a drag source. Enables all groups and items in the tool palette as drag sources on button 1 and button 3 press with copy and move actions. See Gtk.Widget.drag_source_set(). Unsets the tool palette icon size set with Gtk.ToolPalette.set_icon_size(), so that user preferences will be used to determine the icon size. Unsets a toolbar style set with Gtk.ToolPalette.set_style(), so that user preferences will be used to determine the toolbar style. Is True if the Gtk.ToolPalette :icon-size property has been set.